For centuries, the Cherokee built their villages near the streams and rivers that flow out of the Smokies, largely for the bountiful supply of fish that the waterways provided. And to harvest large quantities of fish, they built fish weirs — “V”shaped constructions of rock that start from the banks on either side of the river and come to a point downstream. Men would line up across the river above the weir and roll bundles of river cane downstream, gradually forcing the fish into the apex of the weir. Nets or traps caught the fish, which were dried or smoked as a food supply for their nearby village. Even though weir fishing is no longer practiced, many of these rock structures still remain. 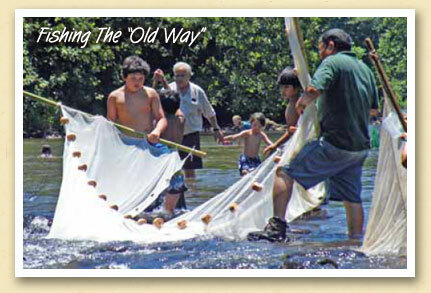 And a group of Cherokee youngsters from the Birdtown Day Camp recently had an opportunity to learn the “old way” of fishing in a demonstration conducted by WATR — the Watershed Association of the Tuckasegee River — with help from Blue Welch (foreground, above) of Cherokee Fisheries and Wildlife Management. The program — a partnership between WATR, US Fish and Wildlife and the Cherokee Preservation Foundation — focused on the river ecosystem and the importance of water quality. Roger Clapp, executive director of WATR, sat the children on the riverbank to eat their lunch, and gave them a lesson on what he calls “mudology.” Runoff of soil disturbed by developments, road building and bad streamside planting practices, creates sediment in the river, which is unhealthy for fish, insects and other wildlife which depend on the river.